Goren has six academic degrees, a BA, MSc and PhD in Quantum Physics, a BMSc, MBA and another PhD in Neurobiology. He did his postdoc in MIT Media Lab’s Personal Robots Group. 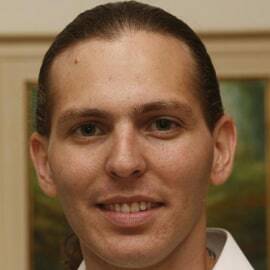 Goren is the head of the Curiosity Lab in Tel-Aviv University. He studies mathematical models of curiosity, implementing them in curious social robots and using them to assess and promote curiosity in children. Goren also developed Quantum Computer Games, has a teaching certificate from MIT and loves to dance and play role-playing and board games. Goren is also the proud father of Noga, Doron and Gaia.